Cody McKenzie, winner of the 2019 Red Bluff Round-Up Top Hand award, poses with Colby Arnett, the young boy fighting cancer. McKenzie gave his buckle to Colby after winning it at the Round-Up appreciation dinner on April 13. Photo by Dave Ramelli/Ram Photo. Red Bluff, Calif. – Cody McKenzie has been awarded the 2019 Red Bluff Round-Up Top Hand Award. The award is given to a volunteer who has dedicated their time and talents to the Round-Up. McKenzie, a Red Bluff native, has been volunteering at the Round-up for the past twenty-plus years. He started out helping long-time director Harvey Camacho with the timed event cattle, and about ten years ago began helping with the track events: the horse and mule races and the wild horse race. Round-Up director Zane Glines is in charge of the track events, and considers McKenzie his “right hand man,” he said. He helps Glines with all parts of the races: gathering information, closing gates, assisting with starting gates, the finish line, judges and security, “basically everything on the track,” Glines said. McKenzie’s wife Stephanie is also a volunteer at the Round-Up, helping in the sky boxes during the rodeo. “They’re both definitely big hitters when it comes to volunteering,” Glines said. 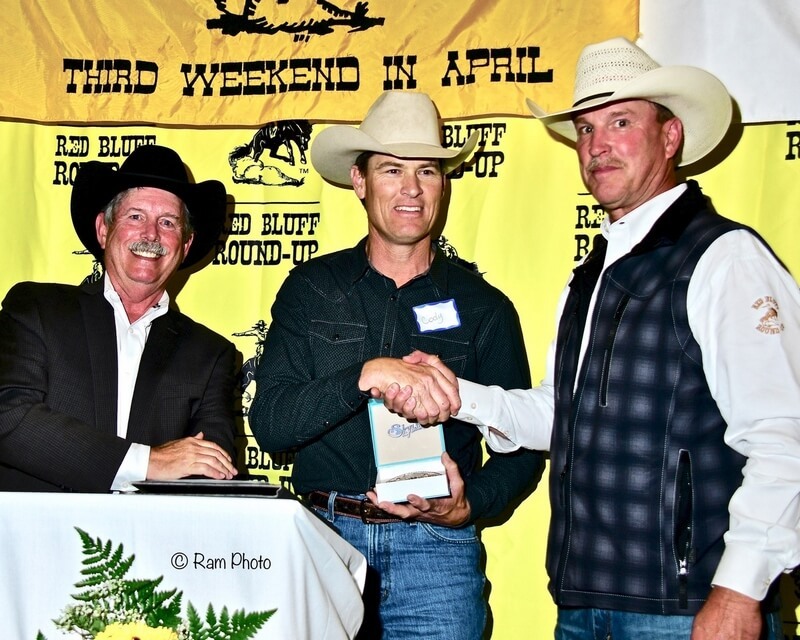 Cody McKenzie receives his buckle for winning the 2019 Red Bluff Round-Up’s Top Hand award from Round-Up director Rod Moore (on right), and Round-Up president Mike Dudley. Photo by Dave Ramelli/Ram Photo. Wings of Angels representatives were present at the dinner. The group raises funds for families with children suffering from life-threatening illnesses. 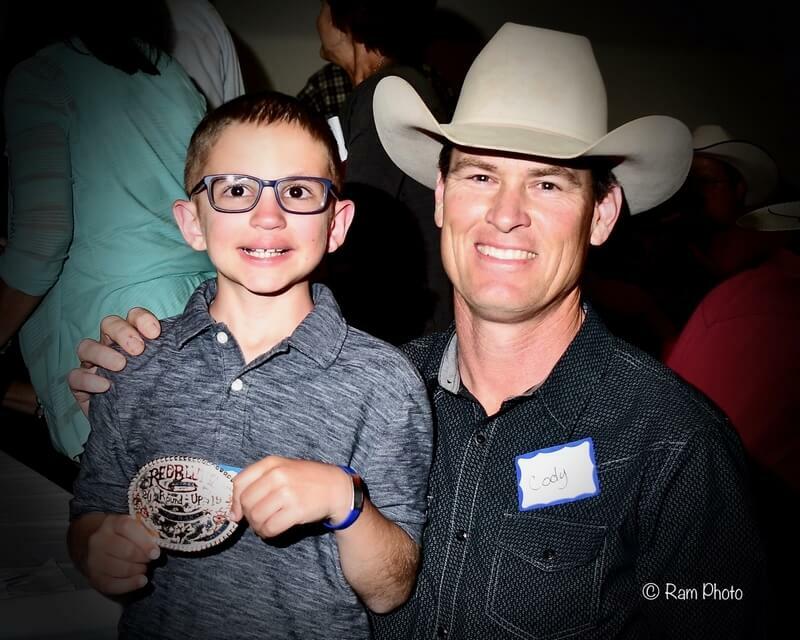 Colby and his family, who are from Redding, will receive a free trip to the Wrangler National Finals Rodeo in December, courtesy of the Red Bluff Round-Up, for the annual Golden Circle of Champions event. This year’s Round-Up will be held this weekend, April 19-21, with performances at 7 pm on April 19, 2:30 pm on April 20, and 1:30 pm on April 21. Tickets are available online, through the Round-Up office, and at the gate. For more information, visit www.RedBluffRoundUp.com.